We’re into oatmeal season, which reminds me of a domestic experience I had at the start of the season, last year, which shook me up. I developed an oatmeal-for-the-winter approach to breakfast approach a few years ago. Moreover, I’m not afraid to admit I like a dash of salt with my porridge. • Oatmeal with a dash of salt. The recipe lists salt as optional, but I consider it mandatory: it cleanses the nostrils, or something. My wife and I, for some reason, maintain three working salt and pepper sets. Don’t ask why. This evolved in such a way that my wife took on the responsibility for emptying and filling sets one and two. I took on the job of monitoring set three. Set three, vessel A, was my go-to equipment for my oatmeal salt. When it ran dry, I naturally went on to use sets one and two rather than refilling set three. Labour deferred is labour saved. It didn’t follow that I would automatically reach for vessel 1A or 2A, because for the forty years of our marriage, we had adopted different views on which is the correct shaker for salt and which is the proper container for pepper. As a result, on several breakfast occasions, when I was less than fully alert and not quick enough to remember, I used set one or set two, instead of set three, I fatally infected my porridge with pepper. This came on top of years of inadvertently salting my tomatoes and peppering my corn. It was time for a summit conference, involving my wife and me. I insisted we come up with a uniform code to govern salt and pepper dispensing. We compared our salt and pepper histories. My mother taught me that salt, with its single s, goes in the single-holed container. Pepper, with its multiple p’s, goes in the shaker with multiple holes. In the event that you have two vessels with multiple holes, the salt goes in the one with fewer holes. My wife could not recall having learned any salt and peppershaker rules. Coming from a long line of freethinkers, she had made her own up using logic and the scientific method. 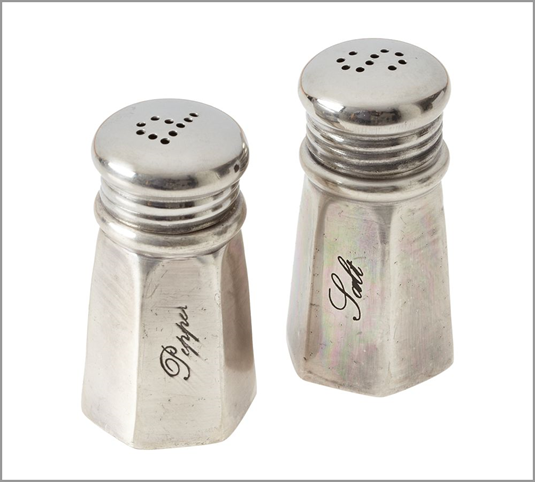 Salt, more frequently used and in greater volume than was pepper, so salt belonged in a container with more holes than one for pepper. It’s as simple as that. • Can’t trust internet answers. Funny enough, people ask the same question all over the internet. There isn’t a consensus, although I admit the balance of responses tips slightly in favour of my wife. It just goes to shows you can’t trust what you read on the internet. In the end, my wife was gracious and yielded to my entreaties; appropriate salt and peppershakers were not exactly the issue over which she would draw a line in the sand. Immediately, we emptied salt and peppershakers 1A and 1B, and 2A and 2B, rearranged the contents. We resolved to move on. I also somewhat sheepishly refilled containers 3A and 3B. The festering incident would never have taken place if there were an international treaty on the identification of salt and peppershakers or if we had had the foresight to trade in all three sets for a set four that had “S” and “P” letters engraved right around the holes. Given the difficulties, in coming up with a treaty of any sort, that is unlikely. Social convention, that is, etiquette, seeks to fill the void, although it didn’t fill it in this case. My oatmeal incident has made me realize that rules of etiquette may not be so bad; it makes such rules decisions for us. As psychologist, Barry Schwartz said in his 2004 book, The Paradox of Choice: why more is less, we’re overwhelmed with choices in our day-to-day life; sometimes its better just to let the convention prevail and save you choice-making skills for what really counts. • Which way to stand a ketchup bottle. Having prevailed in the matter of salt and pepper containers, I am resolved to be gracious and keep my powder dry until another serious issue arises that isn’t governed by a rule of etiquette, such as which way up a ketchup bottle should be displayed. We’ll see how that one shakes out.